The Individual Mandate's Growth In Unpopularity The Supreme Court case against President Obama's health care law may come down to one big legal question: Can the government require every American to buy health insurance? Many Americans say no, but a former White House spokesman says that's because they don't fully understand the law. And an individual mandate was even once proposed by Republicans. 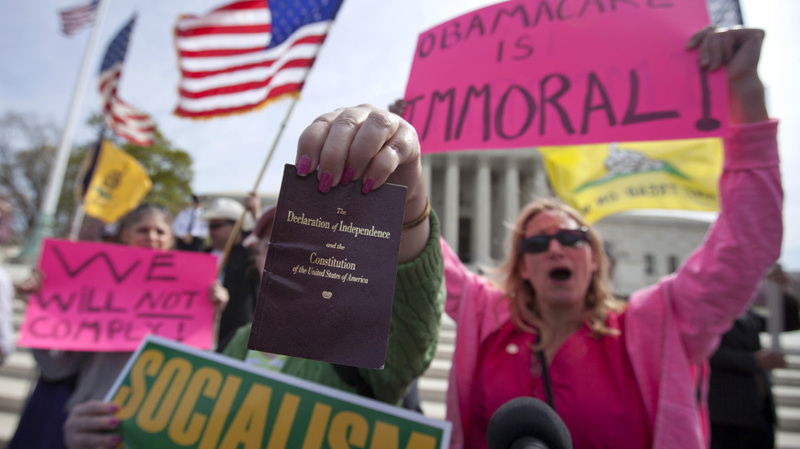 Protesters chant and hold a copy of the Declaration of Independence and the Constitution in front of Supreme Court in Washington as the court concluded three days of hearing arguments on the constitutionality of President Barack Obama's health care overhaul. The U.S. Supreme Court heard arguments this week over key aspects of President Obama's health care law, including the expansion of Medicaid and whether the court even had the right to hear the case. But the core of the challenge mounted against the Affordable Care Act hinges upon its individual mandate, which requires almost every American to have or buy health insurance. The idea of an individual mandate to control health care costs, however, is not new. It goes back to 1989 and a man named Mark Pauly. An expert on health care policy, Pauly was part of a group of academics brought to the White House by President George H.W. Bush. The group's task was to fix health care; its solution was to let the marketplace solve it and create an individual mandate. Pauly tells weekends on All Things Considered host Guy Raz that, at the time, many Republicans, including the president, loved the idea. "Legislation was drafted, but never made it as a bill because the word from the Democrats in Congress was [that] it would be dead on arrival," Pauly says. Pauly says the reason the individual mandate is front and center in this debate is because opposition to it can be cast in the form of a constitutional challenge, unlike other parts of the law. "To some extent, I'm a little surprised that this feature [that] we thought as kind of an afterthought has become so prominent," he says. "The current individual mandate, in my view, is kind of a puny thing because the penalties are relatively small." In contrast, under the mandate Pauly's group proposed, failure to secure health insurance would result in a penalty equal to the premium for the cheapest qualified health coverage. Pauly says Americans would also automatically be assigned to a fallback insurer that the government contracted with. "We thought then, and I think now, that it would be good to have a society in which everybody has at least some basic catastrophic insurance," he says. Though what's being mandated in the current legislation is much more elaborate than what his group had in mind, Pauly says, it's "better than nothing, and we could work with it to fix it up." While Pauly's plan may have been dead on arrival in 1989, it did eventually make it to the Senate floor. The mandate was an idea proposed by Republicans as an alternative to President Bill Clinton's health care initiative in 1993. At the time, newly elected Sen. Bob Bennett, a Republican from Utah, and about 20 other Republicans set out to offer an alternative plan to what they disparagingly called "Hillarycare," after then-first lady Hillary Clinton, who wrote the White House plan. The plan's individual mandate was even supported by Republican leader Bob Dole. Back then, just two Democrats backed it. Bennett tells Raz that the objection to the individual mandate did not arise until after Obama's legislation was written. "Nobody was talking about it during the debate [in 1993]," Bennett says. Though he helped create a plan that included an individual mandate, Bennett voted against the current legislation. He says there are many more problems with the bill, but that the individual mandate has emerged as the "litmus test" for whether it is good legislation. "I'm not opposed to the individual mandate, but I still think the bill is a terrible piece of legislation," he says. "The accounting simply does not add up." Sen. Harry Reid was under pressure from the White House to pass the bill, Bennett says, regardless of what it said. Bennett says if the law stands it will have a devastating effect on states and Medicare. "Frankly, I never even thought about the individual mandate as I voted against [the bill]," he says. At the Supreme Court this week, some of the justices were tough on the administration's top lawyer, Donald Verrilli. It was Verrilli's job to defend the individual mandate, and some say he didn't do that great of a job. For Reid Cherlin, this past week was a dose of deja vu. Cherlin was President Obama's chief spokesman on health care until March of last year. He didn't have to defend the law in front of the Supreme Court, but he tells Raz that doesn't mean his job was any easier. "Answering questions about the bill, no matter what the questions are, is extremely difficult because it is so complicated," Cherlin says. Cherlin says the problem is that the relationship between the American people and their health care coverage is tricky. He says the public generally doesn't like the system, is skeptical of the players and would rather not have to deal with it than have anything change. "And the minute you say, 'Under Obamacare you'd have to do X, Y and Z,' no one wants to do anything with their health care," he says. "They just want it to be there and not get sick." "The president has made it clear that health insurance reform legislation should prevent insurance companies from placing annual limits on health expenditures that can force families into financial ruin. We will continue to work with Congress on this policy." It's that kind of language that has made it so hard to make the case for Obama's plan, Cherlin says. In hindsight, he says, the White House didn't do itself any favors. "There are a lot of good things that it does, but for a bumper sticker or a 15-second blurb, basically you've got to pick one," he says. "There was a lot of disagreement ... so consequently, we were talking about different things at different times." With all of those different messages floating around, Cherlin says, that might be why nothing seems to have stuck.